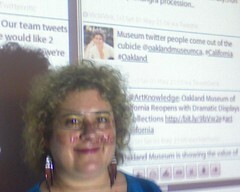 Source Local Oakland Tweeter @trafficologist Standing Beside Her Profile Pic in the Twitterstream. Note from Beth: It is strange sometimes how social networks can have your past, present, and future collide. I met James Leventhal via Twitter and we ended up working together on a project. Through Facebook, I've been able to connect with friends from elementary school, high school, and college. Sometimes connections cross the boundaries of time. Recently, James wrote about some interesting ways museums are using Twitter for offline/online engagement. And, one of the Twitter users who participated was a friend from high school! The San Francisco Bay Area has seen some extraordinary museum openings over the past several years. When the New de Young opened it did a 32-hour party and community celebration, starting a trend that was then picked up by the Contemporary Jewish Museum with Dawn in 2008 and now the Oakland Museum of California (OMCA). “The newly transformed Oakland Museum of California (OMCA) opens Saturday, May 1, with 31 hours of continuous, round-the-clock free programs and events until we close at 6 p.m. Sunday.” Wow. For a lot of folks, the Oakland Museum of California is something of a standard bearer of community engagement and the building itself is a harbinger of today’s museums. When it opened in 1969, OMCA’s design by Pritzker prize–winning architect Kevin Roche was acclaimed for its bold and innovative premise: a museum that also serves as a vibrant urban park and public space. Amongst the long list of activities that took place, one of the more interesting is that a dedicated local team of social networking museum professionals from the Oakland Museum of California (@oaklandmuseumca), the Contemporary Jewish Museum (@jewseum), the San Francisco Museum of Modern Art (@sfmoma), the Yerba Buena Center for the Arts (@ybca), the Exploratorium (@exploratorium), the California Academy of Sciences (@calacademy), and the Asian Art Museum (@asianartmuseum) are going to try and make the “topic” #CALIFORNIA trend on twitter. California is part of the OMCA’s mission. If you follow museums on twitter, a lot of what you find is that the “institutions” are communicating with each other in ways that are novel, educational, engaging, droll or banal — reflecting the overall tone of “dialogue” in the twitterverse. And what’s also interesting about this is how it reveals that there are typically individuals who are responsible for these “tweets.” This provides a new level of transparency for the museum worker, and a higher degree of exposure. Ironically, the “tweeters” often mask their true identities. In fact, this group of professionals in the SF Bay Area all know each other and refer to themselves as the “superfriends,” referring perhaps more to their masked identities than their kinship. It is also interesting because museums have come to play a cherished role in our civic constructs as the development of new museums and major renovations in the SF Bay Area reveal. But they still suffer for issues of relevance. With Twitter and other so called social networking tools, the question of relevance is now in the hands of individuals, the audience even. And it is smart for museums like the OMCA to leverage their ability to make something trend, to reveal their networks. Trending topics show up on CNN. The Oakland Museum of California has been “in the trenches,” so to speak and crowdsourcing community engagement for decades. It’s a good thing that its marketing team can tap into a technology that’s just now catching up. James Leventhal is Deputy Director for the Contemporary Jewish Museum, and an expert in using social media in a museum setting. I've been running small experiments on the art of retweeting for a couple of weeks and it's time for a reflection. Retweets of others: Verbaitem sharing of someone's message that I feel is important for followers to know about. Live Tweeting: If I am at a conference or meeting, I'm usually live blogging or tweeting. I like to live tweet because it forces a discipline of listening. Closing the Triangle: This is a network weaving technique of introducing people in your network. Crowdsourcing Questions: I use this when I'm developing training materials, particularly for case studies or sometimes for demos of Twitter as a crowdsourcing tools. Usually I ask a question, and try to get people to answer in another place like a google document or wiki. Bytes of Wisdom or humor: I share some geek humor now and then. I also share some meta reflections or wisdom about what works or doesn't work in using social media for nonprofits. I generally try to avoid public replies that don't provide context or may not be valuable for everyone. So, unless the reply can incorporate one of the above, I may do it privately if the person is following me. Which of these do you think gets retweeted most often? After some rapid experimentation and testing different types of tweets and measuring results, for me -- wisdom/humor. It may be that those tweets are not as frequent. I think it also has to do with several factors - your content strategy - and also how you've built your network. 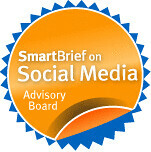 I was tweeting wisdom because Janet Fouts asked me to help with a project "Bite Sized Social Media for Nonprofits." (You can participate or help spread the word.) I shared the above Tweet about rapid prototyping. Why not participate and see if you get retweeted more often? What's useful beyond the retweeting is that you tend to get back insights in the replies. For example, Katrin Verlcas replied with this insight. I asked her to elaborate and she shared this about SCRUM, a methodology for agile development in software. Ah Ha! Been looking for methodologies for agile prototyping for non-software development and this is something that can be informative for another project. What are your different types of Tweets? What works or doesn't work in getting retweeted more often? How are you using a scrum approach to improving your social media use? Just getting started with Twitter? Here's the five minute start. Also, see my Twitter Primers or WeAreMedia. I'm giving away a copy of "Inbound Marketing" by Brian Halligan (Author), Dharmesh Shah (Author), David Meerman Scott (Foreword). I discovered it because of a charity challenge they're running on Twitter to raise awareness of their book, plus raise some money to help Room To Read. I'm a fan of Room To Read, so I asked Dharmesh for a copy of the book to give away to nonprofits, and he agreed - so if you want a chance to win, leave a comment on how your nonprofit could benefit from in-bound marketing. And of course, if you want to help out Room to Read, send this tweet. The definition of Inbound Marketing is marketing focused on getting found by customers. You can read a more detailed definition here. I heard about the challenge because Laura Fitton posted this tweet. I guess you could say it is an example of in-bound marketing. The Challenge: Get as many people as possible to tweet a link to this article, especially the people in the list below by midnight (ET) on Sunday, February 21 2010. The Cause: Room To Read a not-for-profit organization that transforms the lives of millions of children by focusing on literacy. Example: Lets say 20 people on the list below retweet the article (more on how to make this happen a little later). Then, each retweet is worth $0.20 ($0.01 x 20). If the article gets 10,000 retweets, that’s $2,000. If all 50 people below retweet and we get 20,000 retweets, that’s 50 cents per tweet and 10,000 smackeroos for Room To Read. Cool, right? Here’s the diabolical part. My guess is many of you know a few people on the list below. Enough to where you can tweet them, and they’ll listen/respond. I even made it easy for you, just use the convenient link next to each of their names. (Yes, I’m just a helpful guy). Do Your Part: Retweet this article and try to get as many people on the list below to retweet it too. It takes just a minute for you and them. The more that tweet, the more that hear about and the donation amount goes up. Before I launch into some of my criticism, I want to applaud Hubspot for experimenting with different ways to promote their book and help a charity. My criticism below is intended to help such efforts have more impact on the charities. I've been reflecting on the importance of authenticity in CSR programs that my business partner at Zoetica Geoff Livingston wrote about the other day. I think cause-related marketing efforts could use a little bit more authenticity too or at least balance profit motives and altruism. This charity challenge is more focused on getting the word out on the book than helping the charity. Why? I think they've set the bar too high for the number of re-tweets and influencer tweets and bar too low for what they'll donate to the charity. The should have donated something like $1 per retweet and put a ceiling on it. There is also no psychological or emotional motivation to re-tweet. Plus, the influencer list is a not necessarily a list of Room To Read's influencers (and in fact, as of this writing, RoomToRead had not even tweeted about this challenge.) The influencer list is a list of influencers with reach who may be not the attention stream to look at all the replies where as RoomToRead influencers may have less reach, but more affinity with the charity. The formula to trigger a donation is complicated. The amount donated per retweet is based on the number of influencers who retweet the message and the total amount donated is multiplied by the number of retweets. So, if 20 influencers tweet and there are 1000 re-tweets, they will donate $.20 cents per re-tweet or $200. As of this writing they had 298 tweets and 11 people on the influencer list retweeted. (According to the TweetMeme Widget on the post - which could be underestimated) So, let's see - that's 298 x .11 cents = $32.78 donated to the charity. I guess if they sold one or two books, they're even. What can we learn about the right formula from previous efforts? Tweetsgiving which asked people to retweet a message of gratitude in a 48 hour period over Thanksgiving generated over 21,000 tweets. I know it is a different animal - a campaign implemented by a charity without a for-profit marketing motive lurking beneath. But if we look at for-profit companies using the sponsored tweet model (e.g. retweet this message and our company will donate $x to charity), there is a better a benchmark. Take for example the Haagen-Daz campaign to raise money on TwitCause for honeybee research. The fundraising campaign added some extra buzz, a sponsor, Ice cream maker Häagen-Dazs, willing to pay for any Twitter user who tweets out the support for the cause. The sponsorship worked liked this: Häagen-Dazs was offering to donate $1 per tweet for the first 500 people that tweet everyday with the hashtag #HelpHoneyBees. The money was donated to UC Davis research project to further look into Colony Collapse Disorder, as well as help fund the Häagen-Dazs Honey Bee Haven, which aims to teach people about how to create their own honeybee farms. raise $7k for the honey bee research as well as get Häagen-Dazs some great exposure around the contributions they've been making to the cause (and of course, to their brand)." I know from my 53rd Birthday Campaign that it is possible to using the Twitter API, to measure impressions. (Julio Vasconcellio and Kumar Garapaty were kind enough to do the heavy lifting using the Twitter API to crunch impression numbers.) So, one could have set up a donation formula based on impressions. Don't set the bar too high in terms of what you'll donate per tweet. That's not being authentically generous. Rather, be generous and set a ceiling on the total amount to be donated. Work with the charity/cause so you can leverage their most passionate supporters. It's not just people who are interested in your product, book, or service. Incorporate some emotional or psychological message in your message spread. Update: Wow, Dharmesh Shah knows how to listen and redesigned the challenge. Should CEOs and Executive Directors Use Social Media? The NASSCOM India Leadership Forum has multiple tracks based on theme. It also has a track that takes place in a large room with roundtables and a designated discussion topic and facilitator. These sessions are not for presentations, but for disscussion and sharing of ideas. 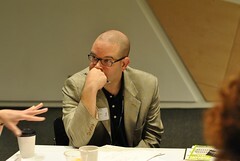 I was asked to facilitate a session on the question, "Should CEOs and Executive Directors Use Social Media?" In preparation for this session, I asked colleagues here in the US to share their collective wisdom so we could see the US perspective. In addition, during a roundtable on social media at the conference, I was fortunate to meet social media experts in India (@nirav@amnigos @pranavbhasin @paritoshsharma and @avinashraghava ) who shared some examples. In order for social media to have full impact, it needs to scale within an organization. Your organization's social media strategy should be not implemented by one lonely intern sitting in the corner of your communications and marketing department. You may be wondering if that means that your executive director and CEO needs to write a blog or have their own Twitter account to share their wisdom. I think it depends. There are definitely some benefits to having your executive director or CEO being present on social media channels. They can provide a human face to your organization's work, a unique viewpoint, and serve as a thought leader in your field. And if your organization finds itself in the middle of groundswell or if there is a major news event or a public relations crisis happens and it is being discussed on Twitter or other social media spaces, your CEO can join it without having to get up to speed. But it is also important to understand that there are definitely challenges to be overcome as well. These includes investing the time to make it successful because a CEO presence on social media is nothing that should be "ghost" written. It has to be authentic, reflect the CEO's personality. There is also the issue of comfort - both with the technology and being transparent. 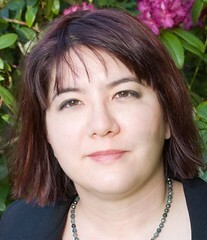 Holly Ross is the executive director of NTEN, the nonprofit technology network in the US. She uses Twitter to share what's going on at NTEN, announce new initiatives, and have conversations with NTEN members. 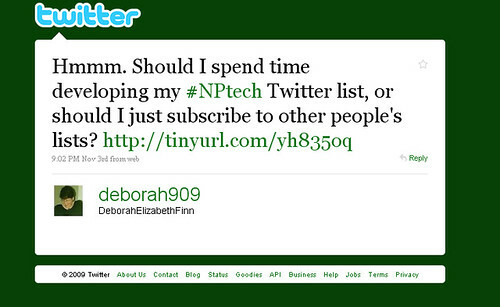 She often uses Twitter to get ideas and feedback on NTEN's various programs. Checking her Twitter stream and sharing some tweets probably takes her 15 to 20 minutes a day and is part of daily routine. Holly also shares more of her in-depth thinking about the nonprofit technology field on NTEN's blog. It is not a "CEO" blog where she writes daily, but a blog that includes the voices of NTEN staff and members. This is a good option for CEO's who don't have the time or bandwidth to write a whole blog along, but still want to be present in the blogosphere. Holly's Twitter account is her personal but it is clearly branded as NTEN. Even the user name, "ntenhross" incorporates her organization's brand. This is a good example of a "Blended profile." charity:water, Scott is often visiting charity:water projects all over the work. Through his twitter account, he is able to easily first-hand reports and photos of the organization's work. He is using Twitter for donor accountability. Scott uses his personal account to Tweet which is separate from the charity:water organizational account. There are a couple of corporate Foundations where we have good examples of CEO's using social media effectively - in this case Twitter. Steve Case is the co-founder of AOL and now Chairman of The Case Foundation and of Revolution (investor in Revolution Money, Exclusive Resorts, Miraval, Zipcar, Waterfront, etc). His Twitter stream is where he shares what he reading about philanthropy and technology but also his travels to different social sector and technology conferences. You can regularly see him discussing issues on Twitter with other thought leaders and journalists. His Twitter account is his personal account, but he identifies himself with his foundation and businesses. Reeta Roy, president and CEO of the MasterCard Foundation, is sending tweets from her site visit to Uganda and Kenya. As background, the mandate of the $2 billion Foundation is to enable people living in poverty to improve their lives by expanding their access to microfinance and education. Reeta is currently in Uganda, where she’s learning first-hand about the Foundation’s partnerships and programs. While the account is the Foundation's branded Twitter account, she is using it for a project to report on their work in the field. 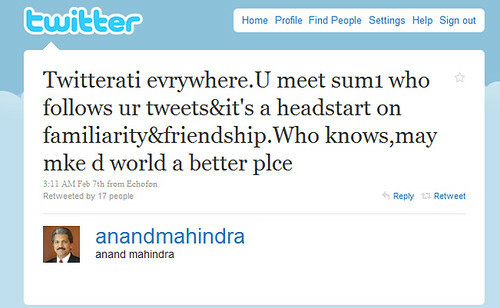 This is an example of a good idea of how to get your CEO started tweeting. Have them Tweet from the organizational branded account for a specific project. This will help learn the work flow, have more comfort, and see first hand if the social media presence provides a benefit for the organization's work. At a roundtable, I had to chance to discuss this question with social media experts from India. They pointed out a couple of examples and I hope to learn more later today. Anand Mahindra s the vice chairman and managing director, Mahindra Group, a large corporation in India. He tweets about many different things, from his company to his family and travels. He interacts with customers addressing their questions and complaints. Take a look at his Twitter stream and you will see personal insights, news about his companies, and insights about social media. Mahesh Murthy is founder and CEO of Pinstorm, a digital marketing firm. He also writes a column for the Wall Street Journal. He uses Twitter to share information about company, connect with people, and to research for writing his blog posts or encourage conversations in the comments of his blog. Of course, using social media may not be for every CEO or Executive Director. If they can't sustain their presence on Twitter or blogging, they should stay away. This isn't to say that they can't have an assistant who might do some of the scanning and flag items to respond to, but if a CEO starts engaging with people on social media channels and then there is silence - that is not a good thing. It is also important that CEOs and Executive don't just tweet or blog for the sake of doing it. They should must have someting to day that is of value or use it for relationship building. Finally, if the CEO cannot take public criticism or wants to have control over what followers or commenters say, then they shouldn't use it and delegate the role someone else in the company or organization. 1. Listen First: Before jumping in, it is useful to do some listening first. Are there other organizations or businesses in your sector where CEOs or Executive Directors are using social media. Find those and review how they are using it. 2. Safe Place to Practice: It is a good idea to do a little bit of coaching with your CEO or Executive Director to show them how Twitter works and to avoid too much "public learning." Some organizations use software like Yammer which is an internal Twitter to practice before setting up on Twitter. 3. Get Past Information Overload: It is important to let busy CEOs know that they don't have to be on Twitter 24 hours a day, 7 days a week. This is also a good idea because the thought of opening up another communications channel might be overwhelming for a CEO is already concerned about email and information overload. Help them learn a quick and efficient way to use Twitter. 4. Pick a Small Project First: Before launching a CEO blog or CEO Twitter account, it might make sense for the CEO to start off using the organization's branded account or blog, particularly if they are not very comfortable with the tools or plan to devote a small amount of time. 5. Share Unique CEO/Executive Director Insights: CEOs have perspectives that others in the organization may not. Whether using Twitter or writing blog posts, they should share their thought leadership, know how, and vision with their fans and followers. A good way to do this is share what they are reading and learning. 6. Let Them Be Who They Are: CEOs and executive directors who are using social media, above, just need to be themselves and let their personality shine through. 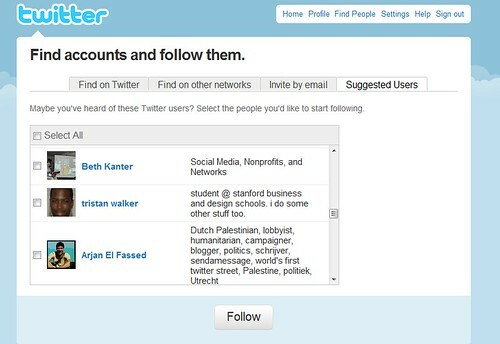 Note from Beth: Ashoka's Twitter account was placed on the Twitter Suggested List about the same time as my account. Tom Dawkins, who is responsible for Ashoka Tweets, offered to write a guest post reflecting on some best practices for using Twitter. Ashoka:Innovators for the Public have just passed the first anniversary of the launch of our main account @AshokaTweets. We have gone through a few key phases in the first year, from working hard for nine months to build our first 10,000 connections and then being placed on the Twitter Suggested Users list and racing to the more than 300,000 we now have. This post will explain how we have approached Twitter and what we have learned. Ashoka was founded on the belief that social entrepreneurs are the most powerful force changing the world. For almost 30 years Ashoka has been seeking out and supporting the best innovators working to create systemic change to join the Ashoka Fellowship. Supporting these visionary leaders, raising the profile of their work and facilitating collaborations and sharing has allowed many to pursue a life of changemaking, scaling their impact and, in many instances, affecting national policy and changing the lives of thousands in their communities. After 30 years of electing over 2,200 incredible social entrepreneurs as Fellows we have been able to observe some powerful themes in their work. And the most significant is this: great social entrepreneurs empower their communities, and invite and inspire those around them to become changemakers themselves. With this insight we gained a deeper appreciation for the fact that innovation happens at many levels and we saw more clearly the kind of world we were working to create, a world many of our Fellows are leading towards, one in which every person has the opportunity to create positive change in their community, and where our collective intelligence and initiative will allow solutions to outrun the challenges we face. This led to our new tagline and mission, creating an Everyone a Changemaker™ world. It was this mission that drew me to Ashoka, and which drew Ashoka to me. Building an Everyone a Changemaker™ world is a very different mission from simply looking for the world’s elite social entrepreneurs, it involves using the stories and examples of these entrepreneurs to inspire people to action, sharing lessons learned across our networks and opening up the innovation process to more people. This called for a new approach to outreach and communications and led to me joining Ashoka in late 2008 in a new position of Digital Marketing Strategist. Changemakers.com is the most high-profile example of Ashoka’s new approach to building community and fostering innovation, but so too is the work we are doing in social media and, in particularly Twitter. The question we asked ourselves when we were planning to launch a Twitter account was: how could we use Twitter to help build an Everyone A Changemaker™ world? In thinking about this question we realized that one of Ashoka’s most important roles as the oldest and largest organization focused on Social Entrepreneurship was as convener, that we have the opportunity to bring together diverse insights and experiences to help map the most effective way forward in tackling many of the world’s most pressing challenges. We wanted to continue to play this role on Twitter. In addition I felt it was important that we be as human as possible, highlighting not only our Fellows but our staff, and empowering them to be more effective advocates. This was also the chance to share news in a more timely fashion, as well as to proactively reach out and form connections, answer questions, and spark conversations. Timely means sharing our news rapidly, as it came in, rather than simply crafting careful news stories for our website at a rate of no more than one a week. It means monitoring the online conversations about social entrepreneurship and issues we care about and directing attention to news hits and interesting blog posts. It means responding to questions rapidly and directing people to where they can find the information they are looking for. The goal of being human has led me to run several Introduction to Twitter seminars and webinars for our staff. We currently have over 50 of my colleagues on Twitter where they are sharing their passion for their work and growing our reach and connections exponentially. The next step will be to integrate this onto our website where soon you will be able to see a list and live stream of all our staff on Twitter, along with one for our Fellows. Ashoka does such a diversity of work, from eHealth projects to new social change financing models, it’s impossible for a single person like me to accurately represent it. Now those with the knowledge and passion for these topics can participate themselves, in their own words, in the conversations of relevance to them, bringing new ideas back into the organization and better informing the wider sector on what we’re up to. Being human also means acknowledging who is the person behind an organizational Twitter handle. The bio of AshokaTweets says “Tweets by @tomjd and friends”. I know when I get into a conversation with an organizational account it means a lot to me that they acknowledge up-front that there’s a real person behind the account, allowing a more personal connection to be made. Finally, in considering how to use Twitter to convene conversations that matter we came up with the ideas of a monthly real-time discussion on Twitter, #SocEntChat, short for Social Entrepreneurship Chat. #SocEntChat takes place on the first Wednesday of every month from 4-6pm US EST focused on a specific theme. Recent chats have looked at green entrepreneurship, mobile innovation and building cultures of social entrepreneurship on university campuses. We have had contributors from North America, Asia, Africa, Europe, South America and Australia, representing entrepreneurs, staff from large non-profits, activists, enthusiasts, bloggers and more. Conversations focus on next steps and areas for further exploration. All the transcripts can be accessed from our Squidoo Lense. The next #SocEntChat is being held on Wednesday February 3 on the topic of Building Peace through Social Entrepreneurship. We would love you to join us. We still have a lot to learn about Twitter and the microblogging medium will continue to evolve in interesting ways. What is clear is that a platform that allows people to connect with one another and talk about the things they care about is a platform made for social change, a place where we can build constituencies and communities capable of collaboratively creating a better future. In other words, it is a place for changemakers, and for building an Everyone a Changemaker world. Anil Dash just made the same discovery that I made a couple a months ago about the impact of being added to the Twitter Suggested List. Being on Twitter's suggested user list makes no appreciable difference in the amount of retweets, replies, or clicks that I get. A lot of followers doesn't equal influence. As Stefano Maggi points out, there's more to influence besides numbers, there is also affinity. Geoff Livingston said it another way: relationships matter more than numbers. We did an experiment to prove our point. Twitter followers who come from the suggested user list don't form real relationships or respond to the suggested users like "normal" followers do. If I'd have continued gaining followers at the rate I had been before being on the list, I'd have about 10% as many followers, but I suspect I'd have exactly the same number of replies and retweets. Before being on the list, a typical link that I tweeted would get between 250 and 500 clicks; After being on the list that hasn't changed at all. So, the point here is that numbers in social media don't matter as much building relationships one person at a time and how you define the value. Chris Brogan makes that point. And that also means, as Seth Godin suggests bullhorns are overrated. The bottom line is to focus on the results of your social media strategy, don't get distracted by meaningless metrics like the number of Twitters followers. Tweetsgiving is 48-hour event to encourage people to express their gratitude using online tools and at face-to-face meet-ups. This two-day event, scheduled for November 24-26, will also invite people to donate to Epic Change. And there are a lot more ways to participate. This year they hope to spread gratitude further and raise enough to help build an additional classroom, orphanage/boarding facility, cafeteria and library at Epic Change’s partner school in Tanzania, and to finding and funding future Epic Fellows like the school’s founder, Mama Lucy. Be sure to check out the Twitterkids. There is also a conversation happening over at Social Edge about listening and amplifying grassroots voices featuring Stacey Monk and Mama Lucy. The theme of Tweetsgiving is gratitude, playing off the US national holiday of gratitude, Thanksgiving. According to recent research, gratitude is a powerful emotion that encourages positive behavior, the giving and receiving of thanks (and gifts.) It is the belief that one has received good fortune due to some one or event outside one's control. Also, other researchers have found that gratitude can lead to happiness. Janet Fouts- Social Media Success! Other goodies will also be raffled off to raise money for Epic Change at the event. I have a lot to be grateful for this year, the year our family made a big move across the country and survived! I'm also grateful for all the learning through my work as visiting scholar at the Packard Foundation and for the opportunity to work with Allison Fine as co-author on a book about nonprofits and social media. What are you grateful for this Thanksgiving season? 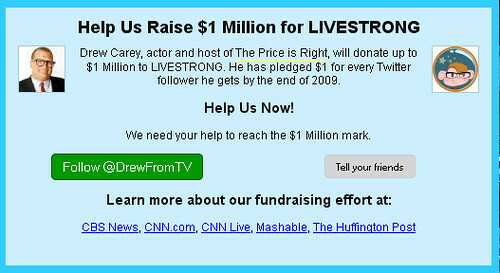 Carey, who is on Twitter with the handle "DrewFromTV," offered $100,000 for the Twitter name "@drew," which is was offered for sale by Drew Olanoff, of "Blame Drew's Cancer," who was willing to auction off his Twitter handle to raise money for cancer research. Drew Carey upped his bid for the Twitter name @drew to $1 million, announcing that he would pay $1 million for the account if he could get a million Twitter followers by 2010. Here's the Million Drew Web Site where you can follow @drewfromTV. It looks like they are using some tracking application. Drew tweeted it this morning. Who wouldn't take 3 seconds to do this simple click action. If the dollar amounts from fundraising campaigns using social networks are disappointing, one response is to say this doesn't work and stop doing it. An alternative approach is to experiment and find ways to improve results. 1) Sponsored Tweets/HashTags: Donors do not have to open their own check books, but instead retweet or use a hashtag to leverage a donation from a corporate sponsor to a charity. 2) Spreading Person to Person Asks: This approach uses twitter and encourages people to ask their friends through Twitter to donate to a charity and spread the ask to their friends. Successful versions of this approach tie a human emotion to the click action - blame, thankfulness, etc. 3) Tweet Meet Give: This approach weaves together online and offline activities and leverages "Tweet Ups." Amanda Rose and Twestival pioneered a networked version of this approach to benefit charity:water, but it has also been used by single nonprofits. Sponsored Tweets or Hashtags is a form of click philanthropy and has been used by nonprofits on their web sites before it was common Facebook and Twitter. Take for example, The Free Rice Game, an interactive online game that donated rice to the United Nations World Food Program based on clicking. All you had to do was click and play a word game, and that leveraged a food donation to fight hunger. The game was very engaging for adults and children alike. For each click, 10 grains of rice is donated. That may seem like a small amount, it is important to remember that millions of people have played the game since its inception in 2007. It is everyone together that makes the difference. The Free Rice Game has generated enough rice to feed millions of people since it started in October 2007 or a total of 70,991,387,110 grains of rice as of October 2009. In 2008, we started to see click action philanthropy on Facebook with Lil Green Patch raising over $100,000 for the Nature Conservancy. In 2009, it has evolved to incorporate a networked approach and there are even platforms or communities of people dedicated to click action philanthropy, including Every Wun. 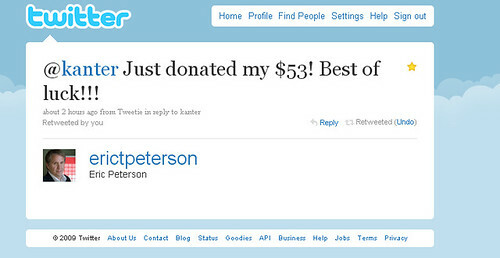 And it comes as no surprise to see click action philanthropy become more common on Twitter, with the platform Twitcause. More and more we are seeing fundraisers incorporate Retweet This Message or Use This HashTag to leverage donations from a corporate sponsor or to simply spread the fundraising message from friend to friend. This transition began a year ago as Twitter came into its own as a charitable gift spreader. (See my Twitter Fundraising Timeline.) We've also seen some versions of Twitter fundraisers not do too well - take for example this follow me Twitter and I'll donate a dollar to a charity or applications that integrated donation engines in Tweets. TwitCause, a service not unlike the popular fundraising application Causes on Facebook, only built on top of Twitter has been implementing some new interesting twists on click fundraising on Twitter. As a basic service, TwitCause will find a cause to support (partially based on community feedback) and use Twitter to drive awareness for it. They also ask that you donate some money. 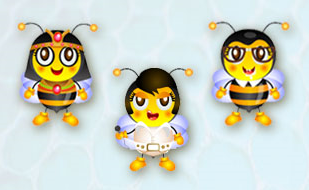 Here's an example of a campaign to raise money on TwitCause for honeybee research. Vasconcellos predicts that we'll be seeing more and more sponsored tweet programs of all shapes and sizes. There are already a number of active causes on TwitCause. And some are building their own Twitter Fundraising Drive pages for sponsored Tweet Campaigns. Here's one to benefit Make A Wish Foundation, each tweet will drive a 5 cent donation from LeapFish to raise $10,000 to send a sick child to Disneyland. That's 200,000 tweets which compared to these other efforts seems like an ambitious goal. I hope they make it for Jacob's sake or if not I hope they just donate the money anyway. Scott Henderson called it "creative philanthropy" but it is really the Twitter version of person to person fundraising asks for small amounts, taking advantage of Twitter's ability to easily spread person-to-person fundraising solicitations. He describes last Thanksgiving's Tweetsgiving campaign and Blame Drew's Cancer campaign. This year Stacey and her flock (I'm one of the honorary turkeys) will launch this year's Tweetsgiving, another 48-hour celebration. They have integrated the Twestival strategy - tweet, meet, and give by organizing meetups from different cities to help promote the drive. I think one of the important qualities that make these and other retweet or hashtag fundraisers successful is to tap into human emotion. Good fundraisers (and marketers) know that tugging at the heart strings can open the wallet. Stacey is doing this with gratitude, Drew is doing it by blame (blaming his cancer). So, the click to donate action needs an emotional lever as well as a money lever. Twestival has had the most success at scaling this model. Plans for 2010 Twestival are already in the works. How to set a realistic goal (total dollars = $ per retweet or hashtag) that helps the nonprofit actually implement the project or solve the need? What is too ambitious or too low a goal? How does the ongoing affinity/relationship building online and offline impact amounts raised? How do amounts raised compare - sponsored tweets or person-to-person asks or tweet-meet-give approaches? 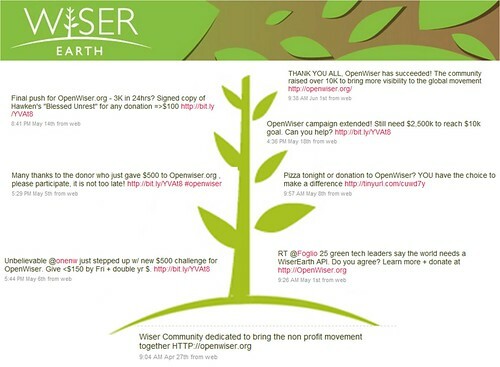 How to make a click philanthropy action on Twitter engaging and fun? How to best incorporate human emotion in the Twitter? Will this approach become so popular and so many nonprofits and corporations using it that it will create "Cause Retweet Fatigue"
Is there value in the impressions metric? What's next for Twitter fundraising? My friend, Manny Hernandez, founder of Tuiabetes Community and author of Ning for Dummies, let me know that today, November 14 is World Diabetes Day. Today, at 14:00 hours (local time), thousands of people with diabetes will test their blood sugar, do 14 minutes of exercise, test again and share their results on TuDiabetes or on Twitter. He is using a tool called "Twibbon" that makes it easy for people to change their avatar to incorporate a visual for a particular cause. Exactly two years ago, the idea of changing the visual of your Twitter avatar to support a cause spontaneously happened as part of the Pea Fund Fridays, a Twitter fundraising campaign created by Connie Reece to support breast cancer research to honor Susan Reynolds. If I remember correctly, it was Robert Scoble who did it first and others took his cue. See the range of creative expression in the flickr group. Two years later, changing your Twitter icon in support of a cause (even though some call this "slacktivism"), is a techniques being used. Remember the sea of green avatars last summer in support of the Iran? There are tools now to make it easy for supporters to change their avatars, although you don't get the range of self-expression. What do you think? Is changing your Twitter profile in support of a cause a silly click action or the first rung on ladder of engagement to get people to do something offline? With the big holiday charitable giving season just around the corner, there's a host of cause-related giving campaigns waiting in software launch and nonprofits gearing up for their end-of-the-year efforts. Some campaigns will launch soon, while others have already swung into action. After last week's social media workshop, a gentleman from a local nonprofit came up to me and said, "Well this social media stuff is all fine and good for large national advocacy organizations, but it is not very relevant for small or regional organizations with really tight resources." knowing that they probably won't have corporate sponsorship at that levels. Whenever I get this question, I wonder myself. Is social media appropriate or relevant for smaller nonprofits organizations? Would about mid-size organizations? Should they stay away? What is the opportunity cost of not participating? "A couple of months ago I was reading an article about Twitter and went to your blog. At the time was getting my feet on the ground with social networking. I set-up a Twitter account, forgot it, figured a waste of time, until now. I connected with @chrisvoss and learned from his videos how to use Twitter to help my organization. Today, we are listed as #21/100 from Twitterholic in Boise, Id. From my knowledge we are the only nonprofit in the top 100. We have people around the world talking with us. Building bridges with other nonprofits around the world. We received our first business hiring us as their charity of choice to send proceeds to. Thank you, for encouraging the little guy like me to tackle social networking. " So, if your thinking that social media is just for corporate giants and fancy flash web sites to support national campaigns or chains and has no value if you doing work in your local community - think again. Be like Cindy Williams and give it a try. What do you have to lose with small low risk investment? What do you have lose by having the conversation? What is the cost of not participating? And, if you are small organization and have succeeded, I want to hear about it. Leave a comment sharing how you're using social media to support your organization's work in a local community or regional effort and using a shoe string budget to do it. And, if you could win a copy of "Twitter for Dummies" that the good folks from Wiley just sent me. Update: Julio disagrees. He feels that small nonprofits should "just say no" to social media and focus their limited resources elsewhere. I think they should open the conversation and look at what they're doing, what's working and start experiment. It's possible get started without a major investment. What's the opportunity cost? Twitter has been rolling out new features for its web interface to small groups to get feedback and then onto full roll out. It did this with Twitter Lists. Over the weekend, I noticed that Twitter's beta retweet feature was available on my account and played around with it. Brian Solis picks out what's interesting about it. The new retweet feature is particularly interesting as it organizes your experience directly at Twitter.com much in the same way third-party clients such as Tweetdeck and Seesmic have offered all along. Unlike these desktop applications however, Twitter.com remains as the pervasive interface for engaging on Twitter. For example, your lists, real-time search results, DMs, Twitter stream, and now retweets are key pillars to the personal experience at Twitter.com. For most users, the new retweet functionality, combined with important, cached searches (including your username), the need to stray from Twitter’s online hub begins to dissipate. 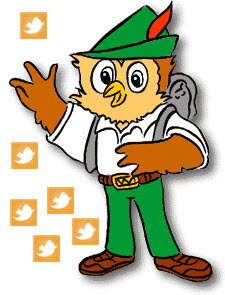 Woodsy Owl: Give A Hoot, Don't Retweet Pollute! The new feature makes re-tweeting a single step versus a two-step process. What I don't like about it is that I can't add my own two cents about Tweet. By making it so easy to retweet messages will this cause an explosion of too much information on Twitter? I thought about Woodsy Owl. Woodsy has been USDA Forest Service's environmental champion since 1970, and is most recognized for his wise request, "Give a hoot. Don't Pollute." That was before we had to deal with the amount of digital information we deal with daily from our email, Twitter, and social streams. So, give a hoot, don't retweet pollute. And with more retweets, the more likely it is that you will see duplicate retweets. This points to the need for more filters better at filtering than our human brains or relying on changes of human behavior. Louis Gray recently reviewed a new product under development, called Cadmus. It filters your real time streams to group similar posts in your feeds to reduce the noise. The service currently works on your Twitter account, your FriendFeed account, or on any number of blogs you add. You can also add many RSS feeds at once via OPML. This is on my list for 2010, to take a deeper dive in filtering tools. Maybe I'm just behind on getting fluent on filtering tools and thus finding the duplication annoying. What filtering tools are you using to avoid information overload or "too much retweeting"? The Internet has a strongly ingrained "list-making" and "collecting" culture. Back in the early 1990's, during my "gopher mistress" days, I could use this Internet protocol to create lists of lists of public files on servers on the Internet. It made it easy for me to navigate through public files available on the Internet in a linear way. 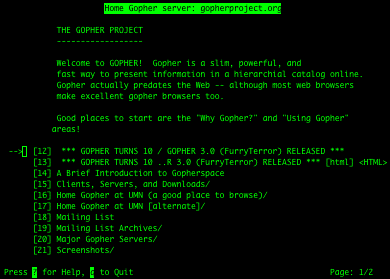 Even better, I could browse, collect, and organize files on my own gopher and make it available for others to "gopher surf." Back then, there was a lot less information on the Internet than there is today - so there was less redundancy of lists. 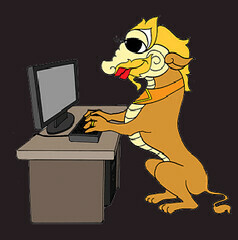 Unfortunately, the gopher did not live a long life, it was soon overshadowed by the World Wide Web. Even in the early days of the web, there was the urge to organize collections of files and links. I discovered the WWW Virtual Library in 1993 when there were only 200 servers on the Internet. I volunteered to be the Dance Librarian. What that meant was that the Library pointed to my dance links on the Arts Wire server. It also enabled the WWW Virtual Library to scale in terms of server capacity and allow for a distributed network of volunteer librarians. As the Web started to explode in 1995ish, I remember the dance links getting so plentiful that I started to organize volunteers who could self-organize different sections on their servers. (I kept the ballet and modern dance links). There is something about Twitter Lists, the new feature recently launched by Twitter, that allows Twitter users to create their own lists of followers that reminds of the gopher. Twitter lists lets you curate your followers and keep connected to smaller affinity groups of your choosing. This feature is similar to the functionality to lists that you can create with popular Twitter clients like Tweetdeck, but with some important and compelling differences. Your lists can be public. This gives us a number of ways to look at Twitter lists and their potential. What made me think about the gopher and early web days, was the feature where you can join any public list to receive the same tweets, whether or not you follow the included individuals. This intelligence of the crowds, yet manual, filtering helps you improve the signal to noise on any your topics of Internet. I was going to spend a lot of time making up different lists and sub-lists of nonprofit techies, social causes, social media gurus, metrics geeks, and the way too many other topics I'm obsessed with, but realized all I had to do was find someone who I knew and trusted and follow their list. For example, I was looking for a list of Twitter users from Africa - and after some conversation with Kabissa on Twitter, I found their lists. However, we're still in the early stages of lists - and lists are like gardening - they require maintenance, watering and feeding. And, that has to be done manually. Will Twitter lists become an graveyard of outdated lists? Maybe we'll see some tools to automate list maintenance, widgets, and clients. The problem with lists is that there is always someone left off the list and that can lead to hurt feelings as Chris Brogan suggested in this post. And while some people disagreed, list are elitist. 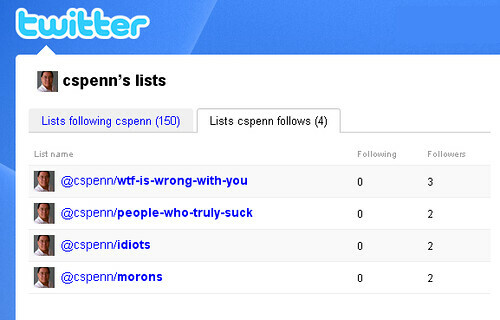 And, then there is the new metric of being "listed" that is how many other people included you in a list. Some view this as "another stupid number to worry about." Don't get me started on stupid Twitter numbers, but I'll save that for another post. * Your organization’s chapters and campaigns. * Related international organizations and campaigns. * Organizations that are somewhat related to your organisation. * Celebrities, politicians and others with a high profile. * Retweeters and people who have contacted you. Twitter lists is just one of some new features that Twitter is rolling out, so as the service grows, so will nonprofits use of it. My Twitter Lists links are here. I encounter a lot of social media skeptics who ask me pointed questions. I can answer most, but sometimes I get hit with a question that I can't answer (adequately) on the spot. I love those questions - they are a real gift. Recently, I've been getting a question like that goes something like this, "All this social media stuff is great if you're fund raising or selling something or running a grassroots advocacy campaign, but what if you're focusing on carefully vetted scientific research or want to impact policy? What if your goal is large scale systemic change, why bother with social media?" A few weeks back I met Melinda Venable, Associate Director Digital and Ethnic Media at Resource Media who told me about the ClimateChangeUS Twitter strategy. The Twitter account was started with a focused goal of raising awareness about the release of the Global Climate Impacts in the United States report last June. A few weeks after the release, they decided to broaden it's goal to sharing the latest peer-reviewed climate science that highlights immediate, near-term threats from human-caused warming. The goal is to be a trust agent for climate change scientific information. They are building a following of journalists and others who are looking for carefully vetted scientific information. What's interesting about this Twitter account is that it isn't an automatic feed that streams links to their own reports. They share the latest, and best peer-reviewed science through Twitter conversations. They also tweet about real-time impacts, which usually is extreme weather and how that fits within the pattern of global warming. They rely only on credible sources. They do offer our opinions or promote any one policy or get into politics. They are using Twitter and a Facebook Fan Page to grow an audience interested in carefully vetted research. They've become a trusted resource for educators, journalists, and others. I'd like to know more about the specific results and how they are measuring the success of their social media strategy - as well as what they are tracking to improve what they are doing. The use of social media is part of a larger strategy to inform the public about the impacts of climate change, not just at the North Pole, but in their backyards. They are co-producing video spots, which air on television and on the Web. They also engage directly with weather casters, a group uniquely positioned to inform the general public, by instructing them about how to incorporate the science of climate change into their daily broadcasts. 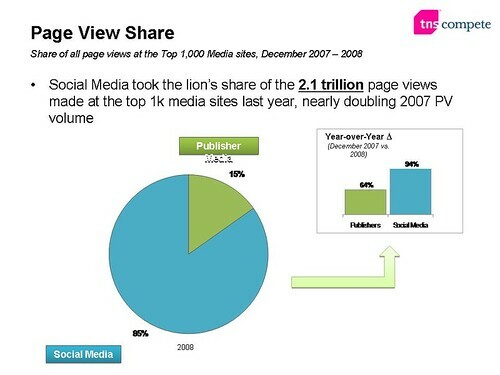 In early 2009, the Compete Blog posted its media trends for 2008, suggesting that publisher media continue to integrate social media. Do you have an example of how Twitter can be used to distributed "trusted" information about an important policy issue? What do Twitter, Books, Wine, and Fundraisers have in Common? We're just getting started as a company, but we believe thinking long term about making a positive impact will allow us to grow in the right direction to make a difference as both a technology and a business. For Twitter to be at its peak in utility, people who would have never had access to the world's information need to be able to not only receive it but engage with it, too. Room to Read, a San Francisco based non-profit, will help us make that happen by bringing libraries and literacy to the world's poorest regions. Together we'll be making some awesome wine over the course of a year to benefit @roomtoread, and with each case sold they'll be able to supply about 60 local language children's books to educate the 300 million kids around the world who can't read. And, with a donation - you get a bottle of wine too! Chris Brogan's Archimedes Effect is from his book Trust Agents (co-authored with Julien Smith). The principle is about leverage. I've been asking myself how can we leverage the addition of nonprofits and charities on the Twitter Suggested User List? I followed the ant trails to the Chronicle of Philanthropy blog post today asking the question, Should Twitter Recommend More Charities? and referring to a post last Friday by Sean at Tactical Philanthropy breaking the news that Twitter had added charities to its list of suggested users. Sean also described a wonderful example of the Chris Brogan's leverage principle by Social Edge which immediately sent out a message to all their new users pointing them to a list of 100 other social entrepreneur focused Twitter users. In June the New York Times wrote about the “suggested user” list saying that Twitter was now a “king maker”. They said being listed could add 500,000 followers and pointed out that social media titan Jason Calacanis offered $250,000 to be listed. Godin used (as Tom Watson said it), "the Ashton Kutcher Metric of Social Change - not yet proven, only a theory!" I am assuming Tom was talking about the number of followers on Twitter as a measure of impact. If you look in the comments, there was a lot of discussion and on nonprofit blogs about whether number of followers is a meaningful indicator or can be translated into value for nonprofits. There was a comment about how a smaller number of passionate followers might be worth more to a nonprofit than millions who select them off a general list. As I was waiting for my plane, I discovered a fantastic and funny post by Alexandra Samuel on social media analytics and metrics about the greatest peril of social media: analytophilia. It's about obsessing on raw numbers and constantly checking the number of Twitter followers or retweets or Facebook insight clicks. She recommends that you don't just look at numbers, but ask questions. I've been advocating this approach for a long time and in many different blog posts. Take for example, "Using Metrics to Harvest Insights About Your Social Media Strategy." They started to board my plane and I glanced down at my Twitter account and noticed that something strange happened. My followers had doubled since the last time I looked! I had to wait until I could get on the Virgin America wifi to follow the ant trails. I discovered that I was on the Twitter suggested users list! So, this sent me over to my new typepad metrics dashboard to see what the impact might be. I think I'm going to have to track this over a couple of months and set something up on google analytics. If I was one of the nonprofits on the list, I'd be tracking conversions via a Twitter landing page. That's what I plan to do. The Chronicle has been crowdsourcing suggestions of nonprofits to be added to the suggested list. I'm going to take a slightly different approach. I'd like to provide a list of lists to nonprofit twitter users and charities. I'm adding these to my Twitter landing page. If you have a list of nonprofit twitter accounts you'd like to add, please leave a comment. And metrics geeks, how should I track this? And, to bring this post full circle, I'm giving a way a copy of Chris Brogan's Trust Agents. Leave a comment! That's some of the schwag and a copy of Shel Israels's Twitterville that I purchased at last night's #tbash, the launch party for the book. I also had 17 copies to give away and delighted to meet United Linens and Walter Akana in person! Shel Israel's book Twitterville: How Businesses Can Thrive in the New Global Neighborhoods is fantastic storytelling and a delightful read! Even though it says "businesses" in the title, there is an entire chapter devoted to nonprofits and fundraising on Twitter in the book. I love Shel's writing - he tells one great story after another. But he also has done his homework. Like a sociologist digging up the remains of an ancient civilization or someone researching their family history, he went to great lengths to uncover the beginning of fundraising on Twitter. He looks at how it is evolved in the last two years. The chapter begins with the story of how I used Twitter in July 07 to raise money for the Cambodian bloggers conference (now Cambodians are tweeting), how Connie Reece raised thousands of dollars to support breast cancer, Stacey Monk's Tweetsgiving, Twestival, and the entrance of large nonprofits into the Twittersphere. Certainly as social media "normalizes" and charities bid for attention in an increasing crowded social space, the future of social media infused fundraising will be different. Nonetheless, the best practices that Shel outlines at the end of the fundraising chapter will still hold true. Okay, so if you've read this far, you'll notice that there are still four books that haven't been given away. I'll be using those to raise money for Leng Sopharath's senior college tuition. So stay tuned. I hoping the winners will have lots of advice and maybe a screencapture of tweeted best practices for goodwill fundraising and share them in the Twitterville Flickr Group. Lisa Colton from Darim, nonprofit that helps Jewish organizations. She will read the book, incorporate some ideas strategies and then do a book giveaway in their blog asking the same question! Lindsay Renee from the Georgia Alzheimer's Association who will read it and then use as a featured item in their fundraising auction. Robin Pratt from the Utah Nonprofit Association who will read it, apply to strategy, and then put in their library for nonprofits around the state to read. I'm expecting each and every one of these winners to share what they learn about Goodwill Fundraising on Twitter! And Congrats to Shel Israel on the launch of his book! What are the most effective ways Nonprofits/Foundations can use Twitter #hashtags? A hashtag is this symbol: #. It is also a Twitter term that describes a keyword, prefixed by that symbol, that helps people track conversations on Twitter. Hashtags are a community-driven convention for adding additional context and metadata to your tweets. They're like tags on Flickr, only added inline to your post. You create a hashtag simply by prefixing a word with a hash symbol: #hashtag. Chris Messina (@chrismessina) is credited with starting hashtags and has written about how to make them most useful. According to the Twitter Fan Wiki, hashtags were popularized during the San Diego forest fires in 2007 when Nate Ritter used the hashtag "#sandiegofire" to identify his updates related to the disaster. Since those early days, hashtags have been used in different ways by nonprofits. One of the most frequent applications has been to use them at events and conferences. It's not uncommon to see the "official" hashtag included with the promotional information about the event, even events or conferences that are not technology focused. The hashtag creates a backchannel for participants. It also makes it easy for attendees to follow the conversation thread and participate whether they are or in the room or following from afar. That's, of course, if the tag used is unique enough. Hashtags can create an ad hoc community of practice or a channel for people in a field to informally share resources or conversation. There are many adhoc Twitter hashtags where nonprofits, foundations, social entrepeneurs, and others are sharing resources or having conversations. Some occur on a regular basis I don't think there is a formal directory of nonprofit hashtags, but there are few terrific blog posts that have good lists. For example, Socialedge compiled a list of Twitter users in the social entrepreneurship sector that included a list of hashtags. Given that hashtags seem to appear and disappear like cheshire cats and most seem ephemeral, a massive directory of hashtags for nonprofits is probably not very useful. However, a list of the ten best hashtag communities and conversations might be. Some of the #hashtag communities are ongoing and unstructured like the #nptech tag community. Others are more formal, structured conversations that happen weekly at a particular time. #4change is a regular chat about social media change. Another example, although not totally nonprofit focused is #blogchat. #blogchat which is facilitated by @mackcollier and uses wthashtag to aggregate the conversation. In my initial analysis of mega list of 90 Foundations that Tweet, I did not look at hashtags. Nathaniel Naskashima, in a comment on another post, shared some insights from his look at the hashtags used by Foundations on Twitter. He observes that the hashtags are general, not unique. As you can see, most of the #hashtags listed above are really way way too general to be of any use. If for instance, you tagged a tweet about your Foundation's performing arts program with #arts, your tweet would be amongst tweets about all kinds of topics in the art world - even tweets about Paula Abdul leaving American Idol. If, however, there was a standard #hashtag for philanthropy/non-profit art like #philart (stands for philanthropy art) or #npart (stands for non-profit art), then I think we would see everyone in this industry getting a lot more out of Twitter (e.g. engaging in conversation, finding it more useful as a social media tool). I think it takes more a unique tag. You need to publicize the tag and encourage conversation around the tag. Also, having weekly summaries that can be shared in other mediums can make the information accessible to others who don't want to participate on Twitter. 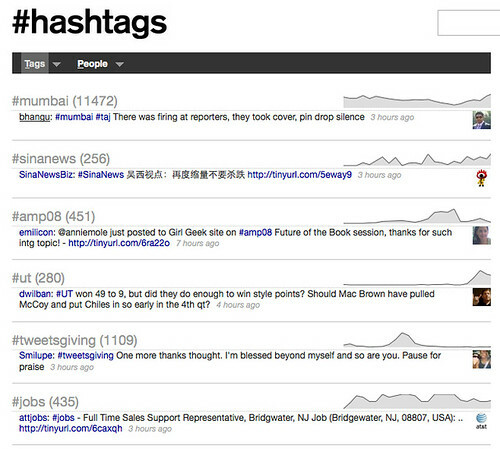 For example, the #givelist tag aggregated all the suggestions from Twitter and then created this site. This takes some facilitation. Hashtags can be used effectively at different rungs on the ladder of engagement. The best example of educating and engaging is how the National Wildlife Federation is using the #nwf hashtag to engage its audience in watching wildlife. Another example is their use in a policy debate. EDF has put together a Twitter Guide to the Climate Bill Discussion. The guide points out the hashtags used by people who are supporting the bill or against. It also provides some "tweeting" points for advocates to use. And, in the case of Twitter Vote Report Twitter hashtags have been used for real-time participatory democracy. What other uses of hashtags by nonprofits are there? What are the lessons learned for using them effectively? What are your best resources about hashtags? The other day, I received this Tweet from Betsy Aoki. Betsy has offered to cover the cost of three more books (plus postage) for me to purchase at the book launch party on August 23rd and get signed copies for the winners. Leave a comment on this post and tell me how you will use Twitter to support your organization's mission. Or maybe you're a "free agent" - someone who isn't affiliated with an organization, but wants to use Twitter for fundraising. I'm also expecting that you might consider paying it forward after you've read the book. Perhaps do a book giveaway to encourage donors to donate or give to nonprofits. I asked Betsy, why are you doing this? 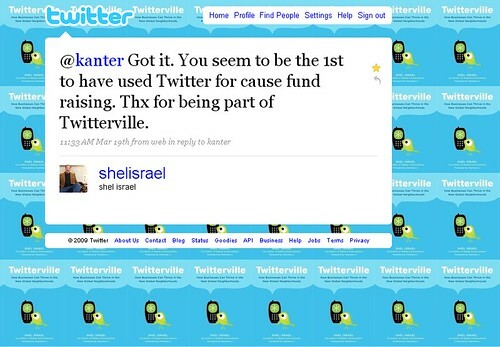 She told me that she was planning to get a copy of Shel Israel's book herself, but had seen my Tweet leading to this post about the nonprofit book giveaway for Shel Israel's book called Twitterville: How Businesses Can Thrive in the New Global Neighborhoods. Betsy says, "One thing I have found really powerful in working with social media professionally is the power it has to mobilize people to help others. Three copies of a book that the twitter community is likely to embrace (and maybe be motivated by, in order to help those less fortunate) seems cheap to me. I think doing this is much more fun than just buying a book I read myself." So, leave a comment about comment about how you might use Twitter for good will fundraising for a chance to win Twitterville! Update: Shel Israel just added another three books so that makes six, plus the earlier three makes nine! It's been almost two years since I had the opportunity to participate in the first Cambodia Blogging Summer. At that time, Twitter was a place for very early adopters and I used it help get technology T-shirts to bring over the participants. Now we have TweetCambodia that has become a gathering point for people interested in finding and following others who Tweet about or from Cambodia. How are Cambodians accessing Twitter? 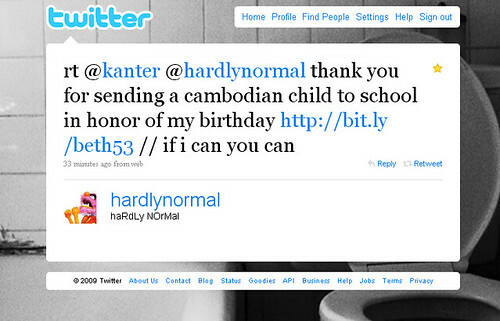 The site's helpful FAQ offers four ways that you can Tweet from Cambodia. I'm sure we'll see a lot of live tweeting from the BarCamp Cambodia 2009. Note from Beth: Last week, I wrote a reflection on a CNET article called "Crowded Roads Ahead for Charity 2.0," musing about the solution. A number folks offers some insights in the comments or on Twitter, including Amanda. I invited her to share her thoughts about cause fatigue and scaling as she launches the Twestival Local. Cause fatigue is something I think about daily; particularly going into our second Twestival this September. I’ve felt a huge mix of pressure and enthusiasm to launch another one from previous organizers and cities who missed it the first time around. I didn’t feel like the Twitter community could handle another cause infused global campaign on the scale of Twestival so soon. My gut told me to think locally and use this international momentum and inspire people to shine a spotlight on a local cause, or a cause that a community would get behind. Where Twestival Global focused all of its energy on one cause, on one day; Twestival Local, taking place the weekend of 10-13 September 2009, has the potential to impact hundreds of causes. (1) What will the not-for-profit do with the funds raised? I think too many times people are raising money without a specific objective in mind. Sure $5,000 sounds like a fantastic fundraising goal, but what if I told you by meeting that target, a local cause would be able to launch an evening food program for the homeless, or make much needed repairs to a home for abandoned girls and boys. People are more likely to relate and give to something they can follow up on and social media allows causes and those supporting to do just that. (2) In addition to fundraising, what are all the ways your city plans to work with the not-for-profit? For me, Twestival is more than just about events in cities raising money for a cause. There is a huge opportunity here to bridge the gap between donors and volunteers. Twestival teams around the world are encouraged to think of other ways they can contribute to their selected cause; provide social media training, arrange for a local company to donate products and services, or leverage Twestival to strategize and create awareness. You wouldn’t know it, but charity: water had very little Twitter presence before Twestival, compared to the way they use it now. Founder Scott Harrison was the only one on Twitter and I’m pretty sure he’d admit that he didn’t really ‘get it’. We sent in some social media heavy-hitters from the Twestival NYC team to give them some free training and now a running joke around the charity: water office is that even volunteers must go through a little Twitter initiation. Causes should recognize specific skills of volunteers as a valuable commodity, the same way it does with cash donations. After working with charity: water on Twestival, I now have a personal vested interest in seeing them meet their goals financial and otherwise. I have always believed in the power of ‘the ripple effect’. I know that Twestival has inspired causes that otherwise wouldn’t have considered investing time in social media. It is my hope that with Twestival Local, even nominated causes which aren’t selected as a final recipient feel an impact in awareness. So, can we have a Twestival every week? In my opinion, no. Twestival involves more than just tweeting; they are physical events happening around the world under short timescales. It is also not organized by a cause directly, but by volunteers who took it upon themselves to get involved. Is the approach of Twestival sustainable? Absolutely. Eventually, the masses will come to realize that Twitter is just a great communications tool. The other fantastic thing about Twitter and certain other social media sites is this ability to develop an online community and empower them to evangelize for you, which can be extremely powerful. Hosting events for fundraising is nothing new. Communicating and engaging with potential donors and volunteers in a creative way is nothing new. To get it ‘right’ is another thing - but there are lessons learned from Twestival that can carry over to even the smallest of causes. Recently, my best friend Alyson (www.alysonwoloshyn.com) was diagnosed with an aggressive form of brain cancer. I mention this only because my life is now directly impacted by cancer in ways I could not have predicted a few months ago. 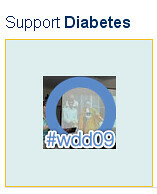 I don’t have a Livestrong band on my Twitter avatar because it is the cool thing to do. I have it because it is something I believe in and have a reason to support. Ultimately people are going to support what resonates with them and how you use social media to reach out can make all the difference. Causes thinking longer term with social media should recognize that there is no magic recipe, no guarantee of online global fundraisers raising over $250k like Twestival. But, what is exciting to consider and continues to keep me experimenting with social media is how it evens the playing field. Thanks to social media, causes can now have direct and personal impact with their audience in ways that were once costly and ineffective. This much I know for sure. Amanda Rose is an entrepreneur and creative strategy consultant based in London. She is the architect behind Twestival and one of the only people in the world who can say they have a Masters in Twitter. Note from Beth: I wrote several detailed posts about Twestival while it was unfolding and aggregated other posts as well. If you want to catch up in the stream, here's some links. Beth Kanter, Are fundraising groundswells an opportunity for mass distraction or a major opportunity? View more presentations from Olaf Witkowski. In an earlier post, I found the following types of patterns related to content shared on Twitter. What Voice Are They Using? At the Packard Foundation, I've had the opportunity to participate in a couple of social media strategy and philosophy development sessions. One of the issues that they are thinking about as related to strategy (and policy guidelines) is the Personal VS Organizational. It's a common area of discussion for nonprofits, foundations, and corporations. The next step was look at the Twitter profiles. The 90 Foundations that Tweet breaks it down into Foundation versus Individual. Yesterday, I was reading Jeremiah Owyang's Corporate Twitter Profile Analysis and thought it could be easily adapted to nonprofits and foundations. 100% branded with primarily Foundation related content. These accounts, which are often sporting the logo and name of the Foundation are used to provide news, grants information, and information resources like research studies, job announcements. There is no indicator of any individuals involved. Many of the examples on the 90 Foundations that Tweet seem to approach Twitter in this way. Pros: This account can be managed by a team, could be set up to automatically stream content. There is d less risk of an individual being co-branded with the Foundation and potentially violating a policy, going off message, etc. Cons: This may be perceived as a just an extension of Communications, PR or the Foundation website with little human interaction. Estimated with about 80% foundation brand and 20% personal/professional brand this account may be a branded account, although it’s clear there’s an individual participating. The content stream is more interactive with conversations happening between the Foundation and "followers." Example: Cleveland Foundation says in the profile "Tweets by Tara" who is in the communications a department. Pros: This account maintains the face of the Foundation brand, yet shows a human element, building trust with the community. Cons: The account may be limiting itself as the community may come to expect and rely on the individual person to participate or may have difficulty scaling if it is only one person. In a rough estimate this account consists of 20% corporate related content, and approximately 80% personal information. The personal information more "professional" in that it relates to the individuals subject matter expertise. These are accounts that are individuals and don’t “officially” or “formally” represent the foundation, but they don’t hide the fact that they’re an employee of the Foundation. Pros: These personal accounts are often organic and are a great way to build connections with a community. Cons: Even if a disclaimer states that “these opinions only represent me, not my employer” they still are representatives of the brand. When it comes to issues like lobbying, there may be legal issues. These accounts are 100% personal content and have no tie or mention of foundation or branded information. These personal accounts, either created by an individual that doesn’t want to be associated with their employer –or their employer won’t let them is void of any corporate ties. Pros: This account has no tie or risk to a brand. What profile is the "right" way to go? What type of content should you share? There are no definitive answers. These decisions have to reflect the organization's Internet communications objectives and social media strategy. Also, the decisions need to reflect internal discussions around philosophy, policy and guidelines for social media use. 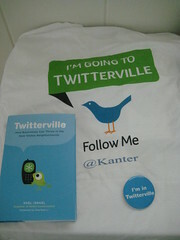 Shel Israel has written a book called Twitterville: How Businesses Can Thrive in the New Global Neighborhoods. It's a great read! Fabulous storytelling. Better yet, I've got a couple of advanced copies to give away. Even though it says "businesses" in the title, there is an entire chapter devoted to nonprofits and fundraising on Twitter in the book. But wait, it gets better. I'm planning on attending the book launch party on August 23rd and will get signed copies for the winners. Okay, so if you've read this far, let me tell you what you need to do to win of the copies of the book. If you have a screencapture of a tweet you think is a best practice for goodwill fundraising on Twitter, leave a comment with a link. Better yet, add it as a photo to the Twitterville Flickr Group. Earlier this week, I had an opportunity to run the social media strategy game with senior program staff at the Packard Foundation. I used the same fictional organization, the Earth Worm Sustainability Network, as I used in the Network Effectiveness Grantee Convening back in May. This is the first time I ran it for people all from the same organization, with a limited amount of time, and mix of experience. I am feeling an urge to tinker again with the cards and formats, more specifically to add cards for listening/engagement on social networks. Using it an internal training, it is important to have someone with hands-on experience in each group and this spreads the organizational learning. I was also reminded by one very smart colleague that the Twitter audience card had out-of-date information. It was from April, 2008! At that time, the audience skewed younger. In the last few months, Twitter has become more popular with old people. The definition of "old people" is pretty broad and is often used to describe both the 35-54 age segment and over age 55 segment, particularly with studies that examine the increase of "older users" on social network sites. I'm in the 35-54 segment, so after asking where my rocker is on twitter, Howard Rheingold quipped, that he must be "very old," but would much prefer the label geezer. I guess that makes me a pre-geezer. Meanwhile, yesterday Mashable reported that "Tweets Don't Tweet"
If you’re under 25 and use Twitter, you’re not the source of the site’s tremendous growth. While we recently questioned the findings of a largely anecdotal report from Morgan Stanley written by a 15 year old, Nielsen has now produced figures that confirm the trend: young people don’t Tweet. I was invited to present to this group about how nonprofits were using social media effectively. These young people consist of the most talented and enthusiastic high school students from around the country who were brought together on the Stanford campus to learn about the figut against hepatitis B (HBV), scientific and epidemic aspects of the disease to strategies of outreach and education. They were working together in teams to apply their knowledge to design an outreach event that also incorporated social media. After the presentation, I got asked some terrific questions as these younger leaders of tommorrow grappled with adding social media to their outreach plan. I invited them all to join my fan page or rather focus group so we could continue the conversation. I got to meet some great folks like Amy Yu and Chrstine Li. 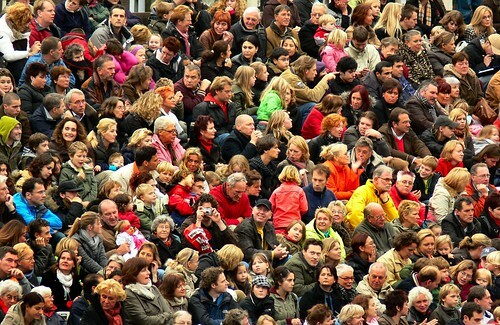 How does knowing more about the demographics of Twitter users shape your social media strategy?